This Deluxe Mini Play Loft from Strictly for Kids lets infants and toddlers climb and explore safely. Side panels with unbreakable Lexan windows let caregivers keep children in constant view. 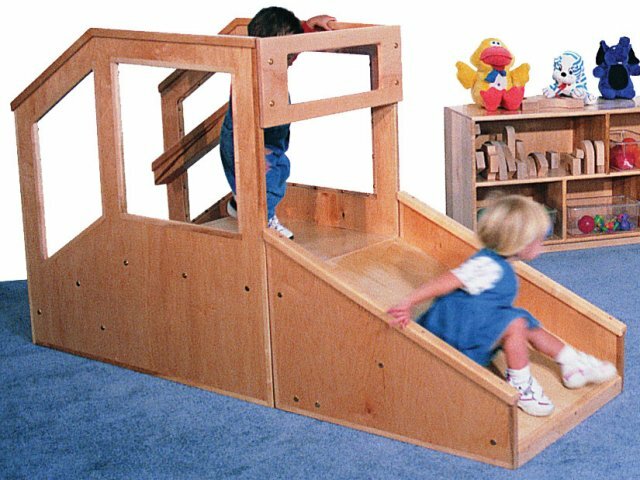 Lower hand rails above the stairs help little ones keep their balance, and the slide features a safety barrier to prevent tumbling. Constructed of solid maple with 5 coats of marine-grade finish for a lifetime of play. Ideal for 8-23 month olds. Exceptional Durability: Solid maple construction makes these play lofts unusually strong and highly durable. Full View: Indestructible Lexan windows keep children within constant view of caregivers. 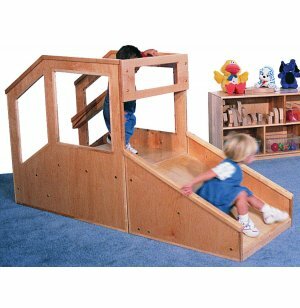 Safe: Double handrail and safety barrier on slide keep little ones safe. Builds Gross-Motor Skills: Encourages infants and toddlers to explore while building gross motor skills like crawling and climbing. Facilitates Social Interaction: Promotes social interaction and turn-taking skills. Easy Assembly: Arrives in two sections that snap together within seconds – no tools or hardware required. Fully Carpeted: This play loft is fully carpeted (except the slide).